A majestic oceanfront home on Great Diamond Island, Maine required an equally grand kitchen. 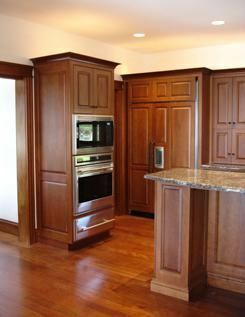 Every detail of this elegant kitchen including the cherry paneled island with raised bar seating was built to the exact specifications of owners that had a firm vision for their home and their kitchen. 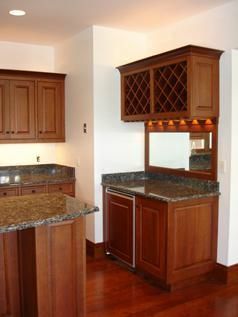 Integrated cherry refrigerator and dishwasher door panels coordinate with cherry flooring, moldings and adjacent cabinets, and are enhanced by flawless granite countertops and subtle uplighting. Exquisite cherry architectural millwork and cabinetry are evident throughout the home. 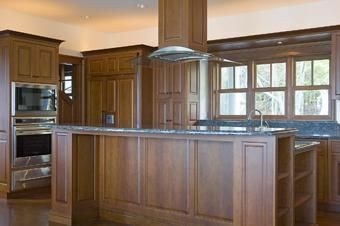 Freeport Woodworking kitchens are designed and built to accommodate each client's style and budget. Dimensions: Architecturally designed custom kitchen.